On the way back from Germany, we spent a couple of nights in Singapore - a chance to defrost after a German winter! We often transit through Singapore on the way to and from Europe, but had never actually visited properly together. Indeed, prior to this trip my last visit to Singapore was 11 years ago, (see here, here and here for my old blogposts), and Sandra had never been. We were definitely overdue! 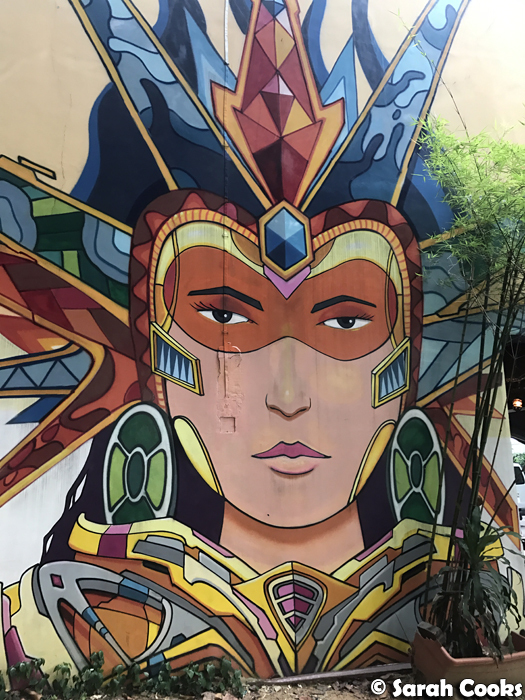 As we were just there for two nights, we certainly couldn't experience everything, but that also took a lot of the pressure off - rather than trying to cram in an endless list of must-dos and must-eats, we just took it easy and let things happen. We're usually compulsive travel planners (God, I love itineraries), but this time we just sourced some recommendations from friends on Facebook, and did some light Googling the week before. (Of course, accommodation and flights were booked months in advance - we're not animals - but we just decided on food and activities as we went). 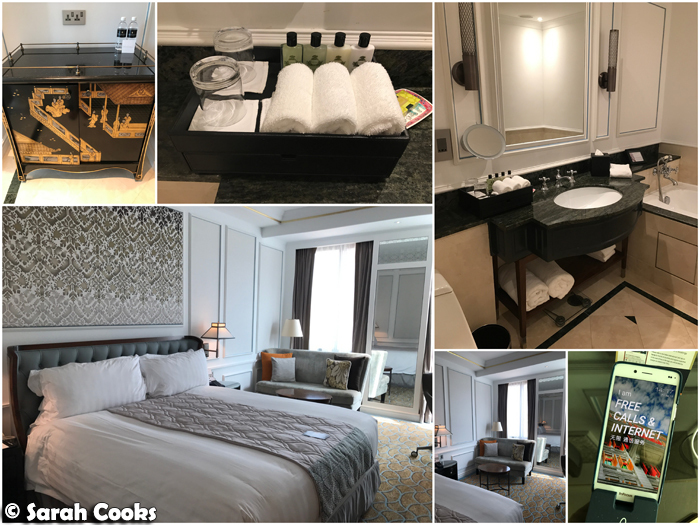 We stayed at the InterContinental in Bugis, which was awesome. Highly recommend! It's a beautiful colonial-style building, with very comfortable rooms and excellent service. 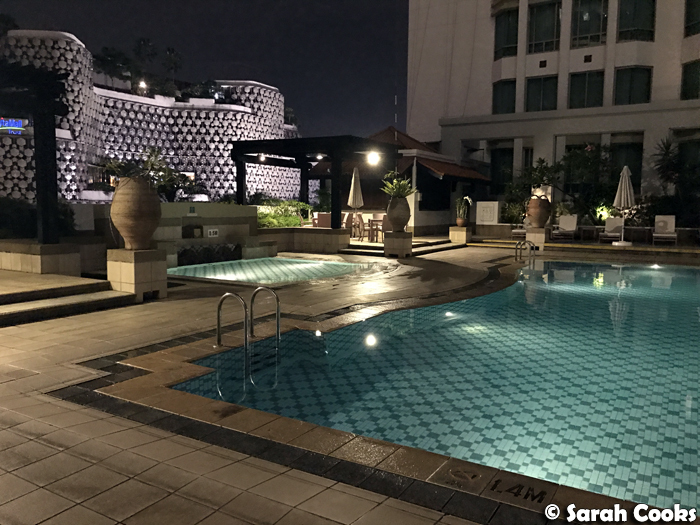 And the rooftop pool was perfect for cooling off after a long day in Singapore's incredible humidity. 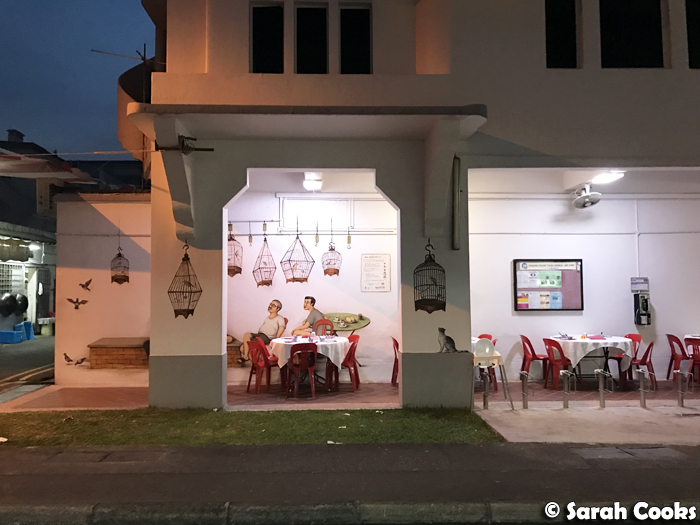 (I can't speak for the food at the hotel - if we'd stayed for longer we would have probably tried the breakfast in-house, but given the short trip, we wanted local Singaporean food at Every Available Opportunity). 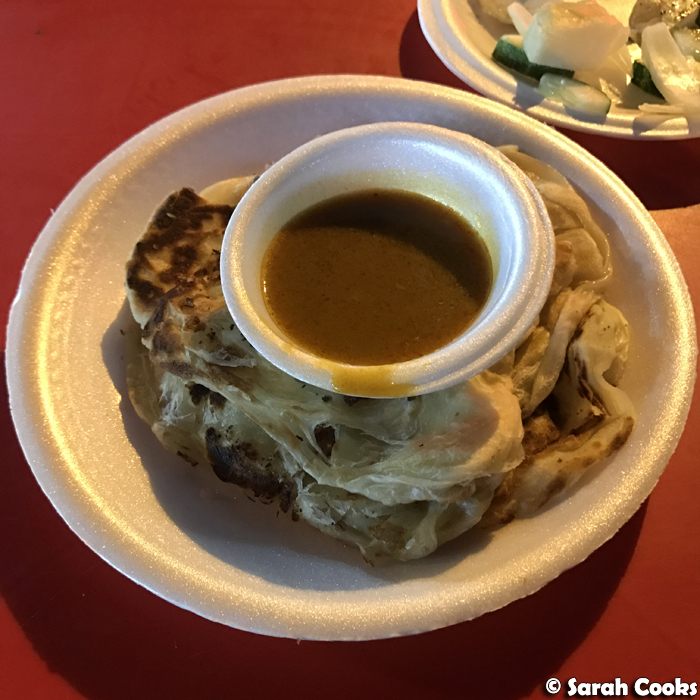 And speaking of which... our first breakfast was at the Albert Centre hawker centre (270 Queen St, Singapore 180270), which is just behind the hotel. We had to keep ourselves busy for a few hours as we arrived very early in the morning after an overnight flight from Frankfurt, and our room wasn't ready when we got there. We were super exhausted, but it was totally worth it! 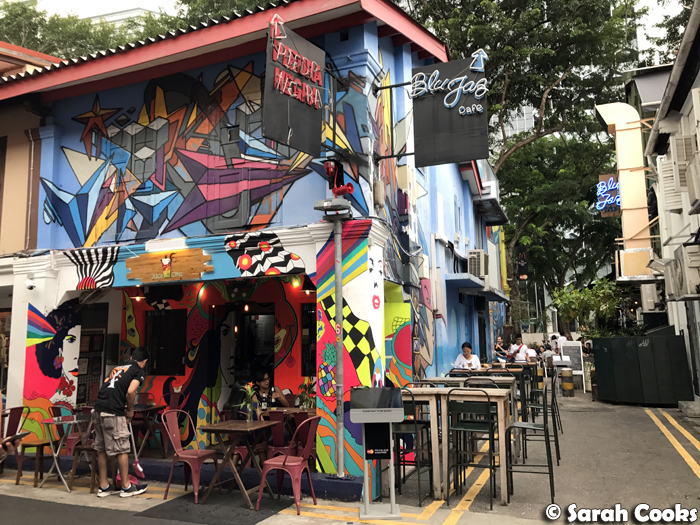 I'm told that Bugis was something of a saucy district a few decades ago, but now has been redeveloped and is more family friendly. 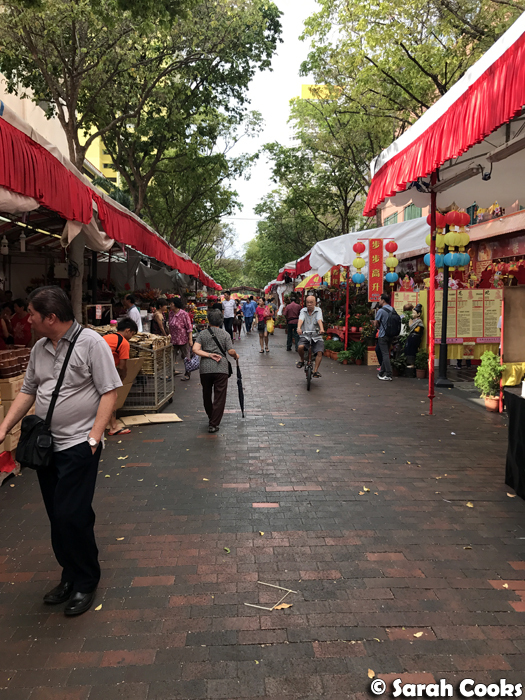 This is the area we found that awesome Chinese New Year market and the Kwan Im temple that I told you about in my Chinese New Year post. (I snuck in an opportunity to pray, or "ke pai pai", as we say in my family, woohoo). 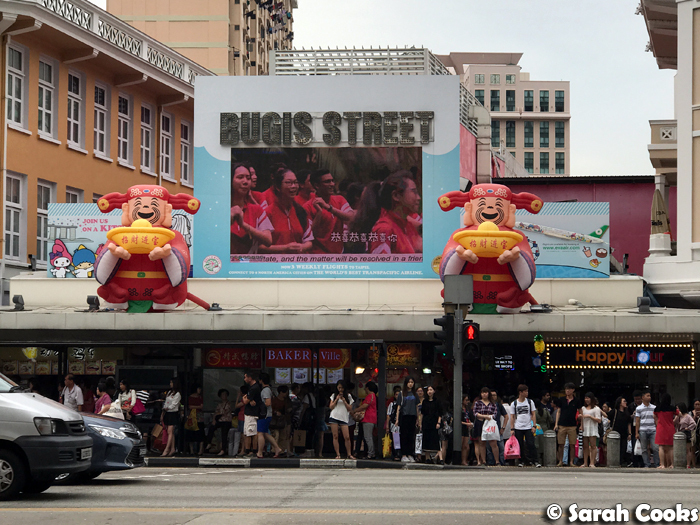 Nearby, there's also the Bugis Junction shopping centre, and the Bugis Street market. I'm not usually one for crowded markets selling knickknacks, but the nostalgic vibe from the loud Chinese New Year music really drew me in! 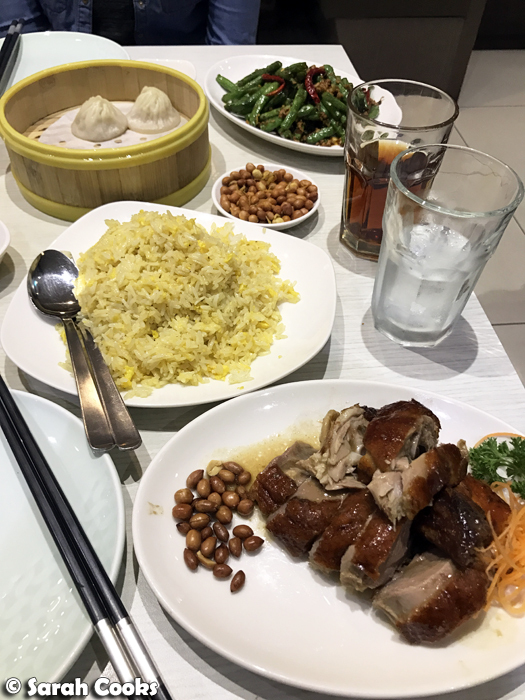 After check-in and a much-needed nap, we wandered around the basement food court of Bugis Junction to get some lunch, and decided on Crystal Jade La Mian Xiao Long Bao. (The basement reminds me of the Melbourne Central basement food court, but with vastly better and more varied food options). 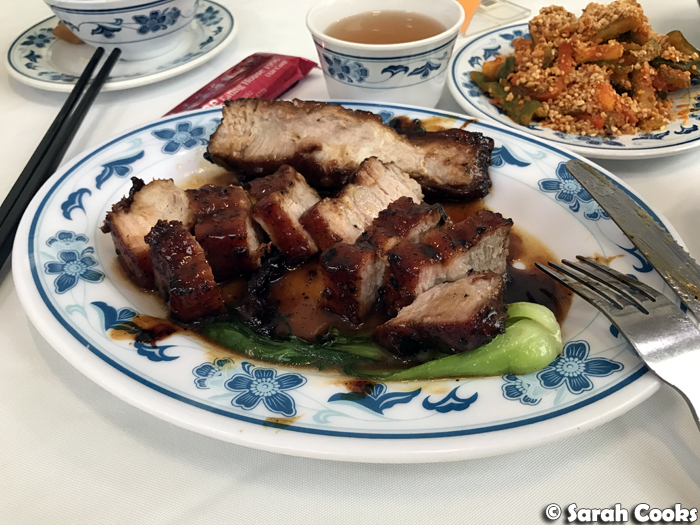 The food here was great, especially that roast duck. Just look at it! 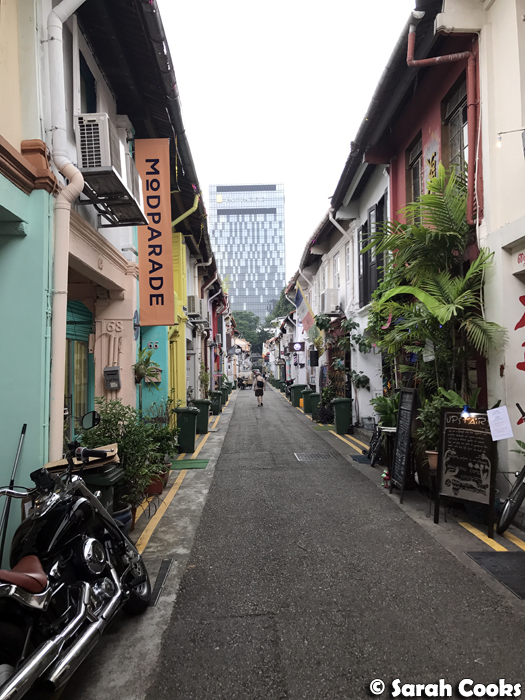 In the afternoon, we took a walk down and around Haji Lane, a quirky hipster street in the Arab district that's now full of cute little boutiques, cafes and bars. Dinner that night was at Lau Pa Sat (8 Raffles Quay, Telok Ayer Festival Market, Singapore 048582), a place that kept coming up whenever I asked for recommendations. 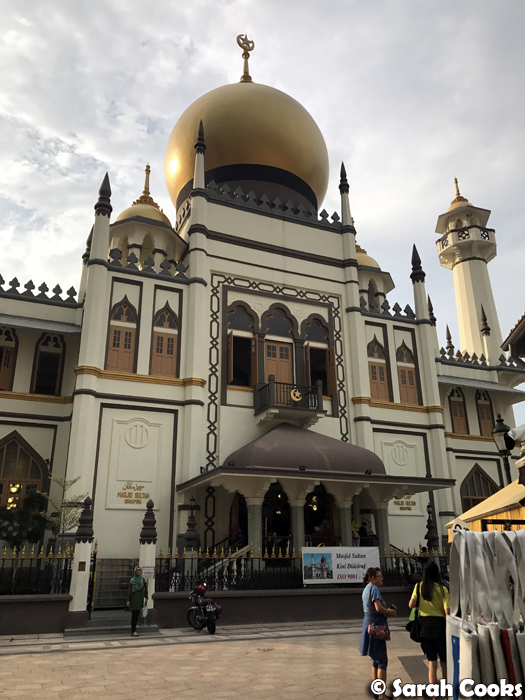 Lau Pa Sat ("Old Market" in Hokkien, was Singapore's first wet market, and has since been converted into a huge hawker centre. 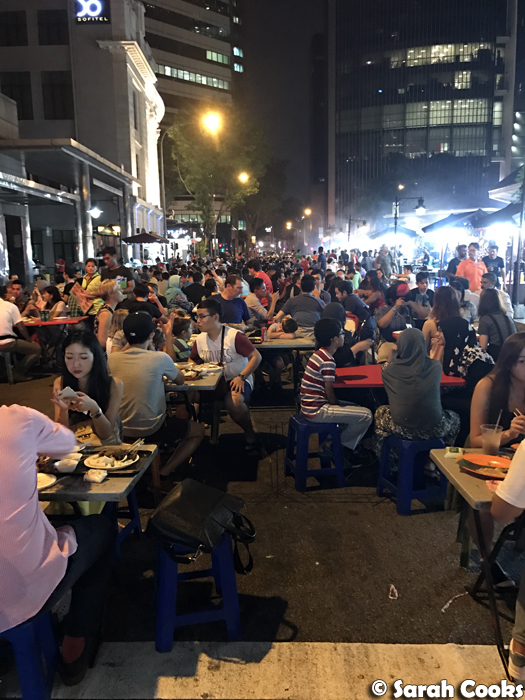 It's located in the heart of the financial district, and at night they close off Boon Tat Street to traffic and fill it with chairs and tables, and many satay and barbecue stalls. 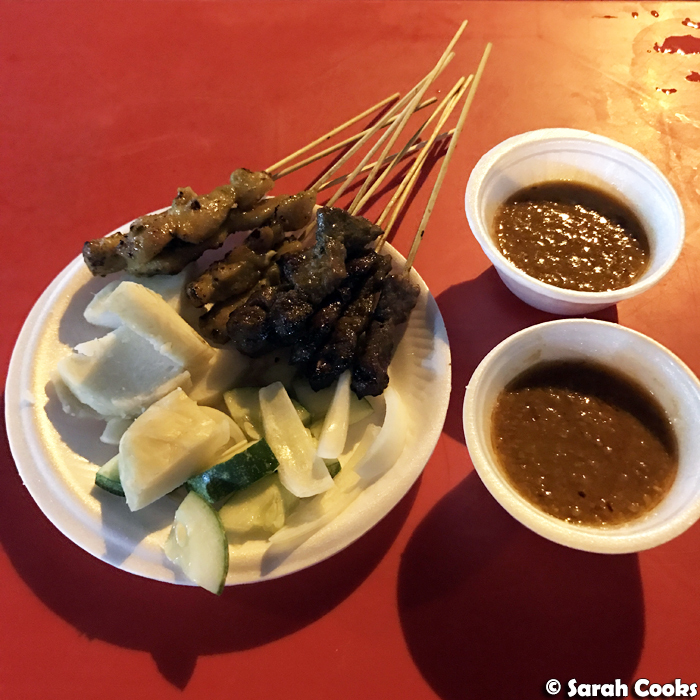 The satay was excellent and the atmosphere was so fun. I would consider this a must-visit! Back at the hotel, there was time for a quick dip to cool off before bed. At 10pm it was still 27C and 80% humidity! Woah. Bright and early the next morning, we got breakfast at Ya Kun Kaya Toast in the Bugis Junction basement food court. If we'd had a longer trip, I think I would have liked to go find a really old timey coffee shop (perhaps the original branch of Ya Kun? ), for the nostalgia factor, but given our limited time in Singapore, this modern branch, close to our hotel, was fine. What am I saying? More than fine. 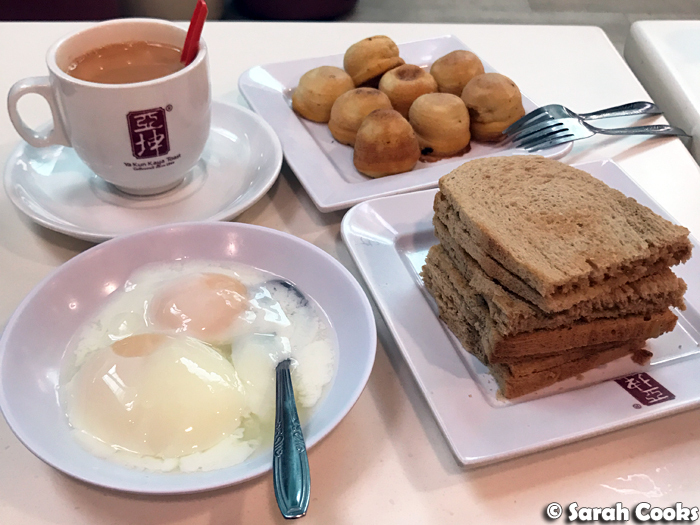 Kaya toast and hot kopi are the best! After breakfast we went to see Gardens by the Bay. 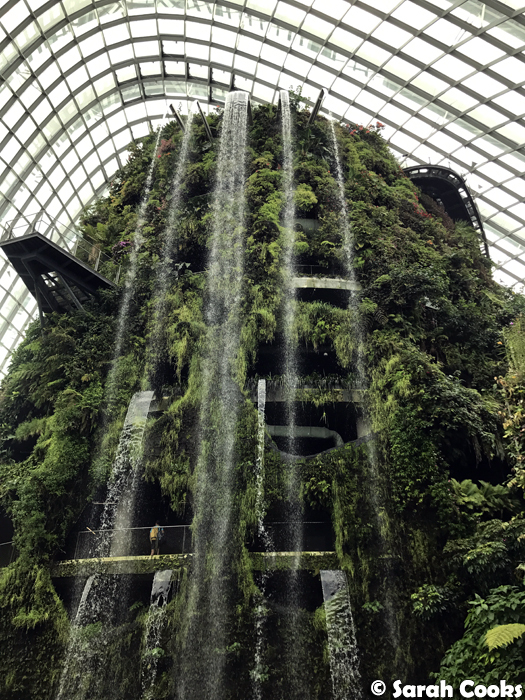 There is a lot to see here, and I'm sure you could easily spend all day exploring the gardens, but we limited ourselves to the Cloud Forest (amazing!) and the Flower Dome (still good but not as impressive as the Cloud Forest). We loved the Cloud Forest so much we went through twice. (And it didn't hurt that it's nice and cool in there, with regular mistings). 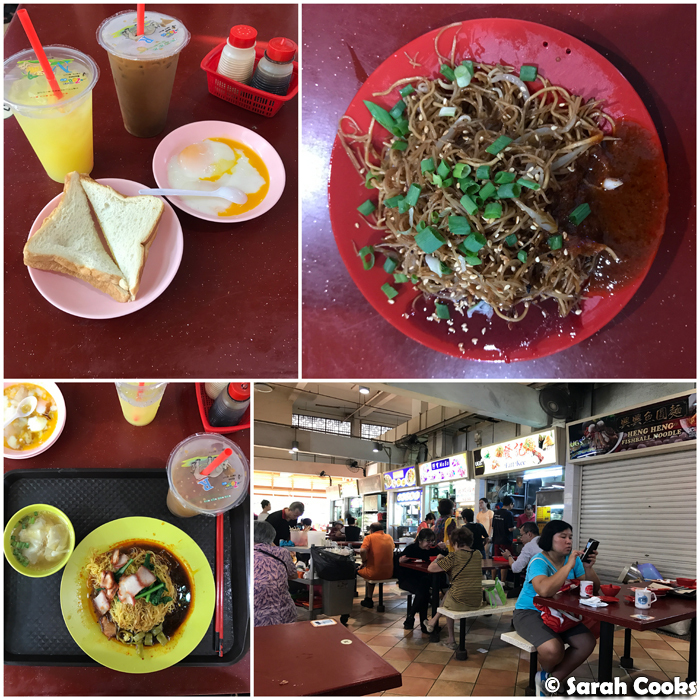 Lunch was at the Maxwell Hawker Centre (1 Kadayanallur St, Singapore 069184), that hawker centre that was once featured on an Anthony Bourdain program. 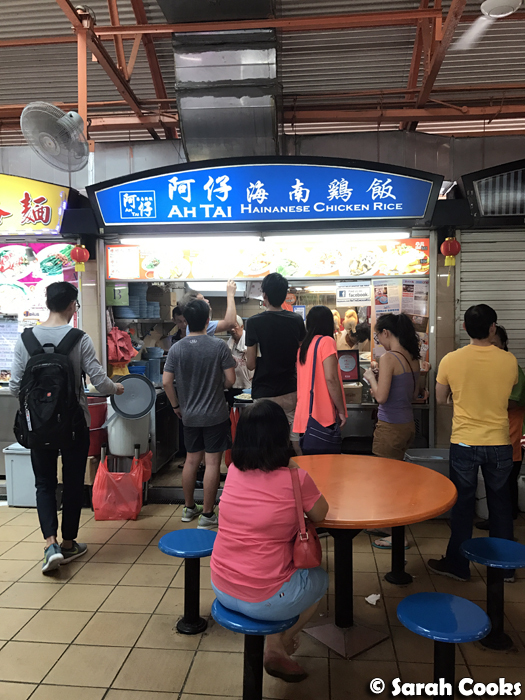 Tian Tian chicken rice is the famous stall, and has the queues to match. A whole lotta nope! 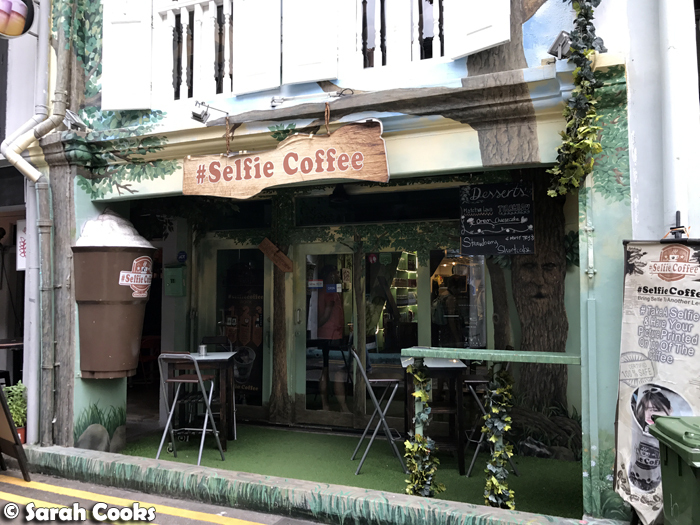 (Perhaps if I lived in Singapore, or was there for an extended period of time, I might make the effort to try it once). 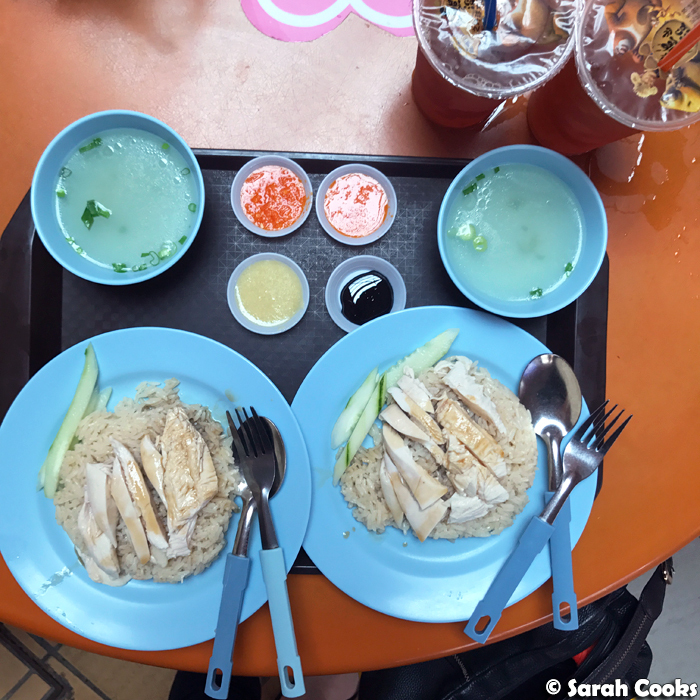 However, in my pre-trip research, I learned that the owner of the nearby Ah Tai Chicken Rice stall actually used to work at Tian Tian, so I was confident he'd make excellent chicken rice as well, and that's where we bought our lunch. (Rumour has it that the Ah Tai uncle had some kind of falling out with the Tian Tian aunty and then left to open his own stall). All the chicken rice, none of the queues. 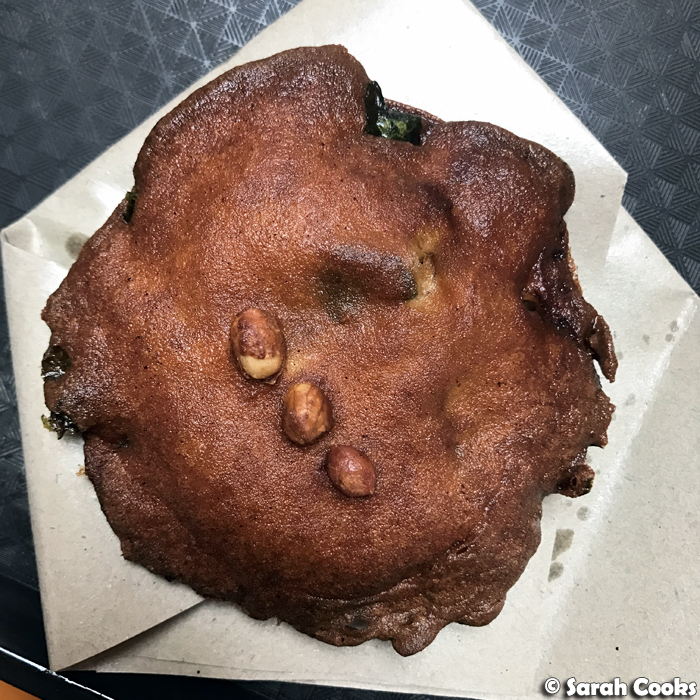 I also had a deep-fried oyster cake from the Maxwell Fuzhou oyster cake stall - delicious. 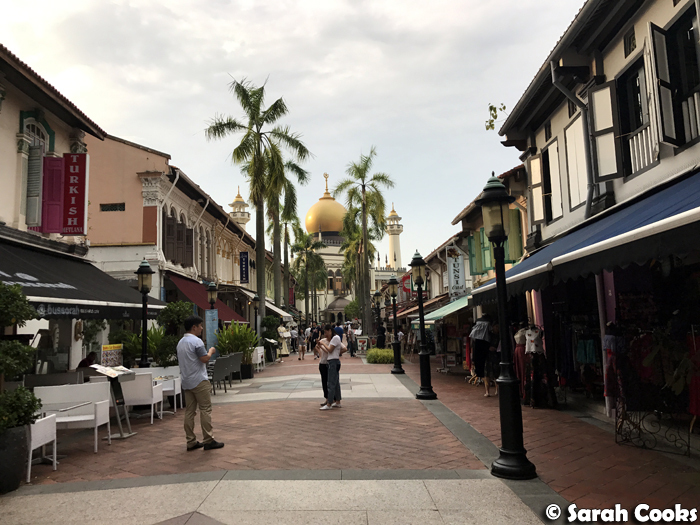 After lunch, we went for a walk down Orchard Road, which is where lots of the big hotels and malls are (Tangs, Takashimaya, Isetan...). It used to be the place to shop when I used to come to Singapore with my family as a kid, and I wanted to visit for old times' sake, and to show Sandra. It wasn't as good as I remembered it - perhaps because I'm a grumpy old lady now who hates crowds! We were also too full to buy anything to eat, and we're not really into designer shopping either, so there wasn't much there for us. I'm still glad I came to check it out again, but I wouldn't go out of my way to visit next time. We were fortunate to be able to catch up for dinner with my friend Germaine (you may remember her from such posts as "Margaritas at Cafe Iguana") and her family. Germaine and I did Cinema Studies at uni together, and I'm glad that we've kept in touch! 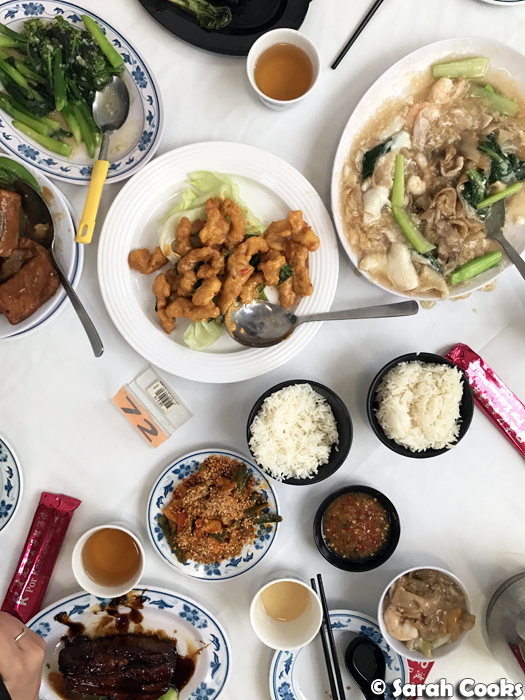 They kindly took us to Por Kee (69 Seng Poh Lane, Singapore 160069) a traditional wok fry restaurant in trendy Tiong Bahru. The food here was absolutely incredible! 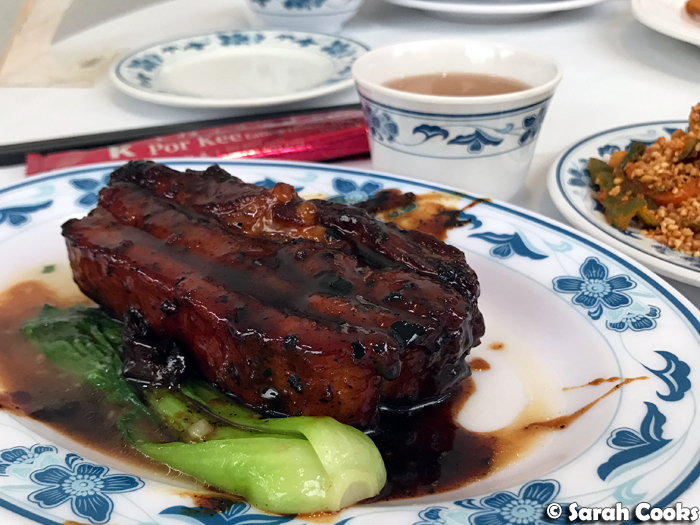 Special shout out for the salted-egg squid, and the champagne pork rib. 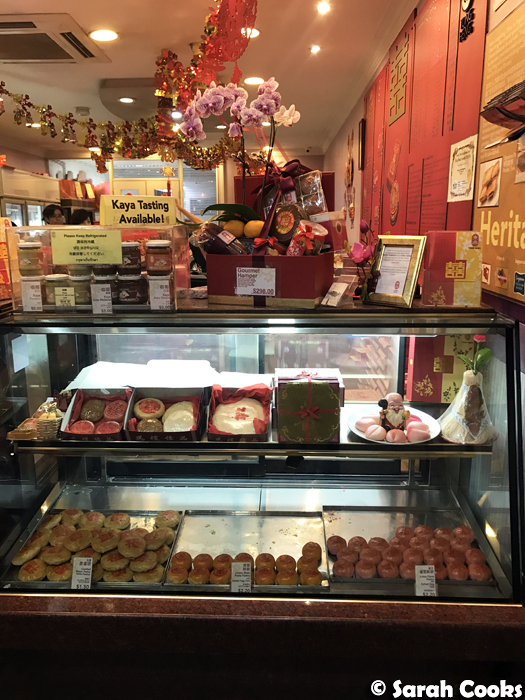 After dinner, Germaine took us for a drive around Chinatown to see some sights, and insisted we stop for egg tarts at Tong Heng (285 South Bridge Road, Singapore 058833), a traditional Chinese bakery that Germaine has been visiting since she was a little girl. 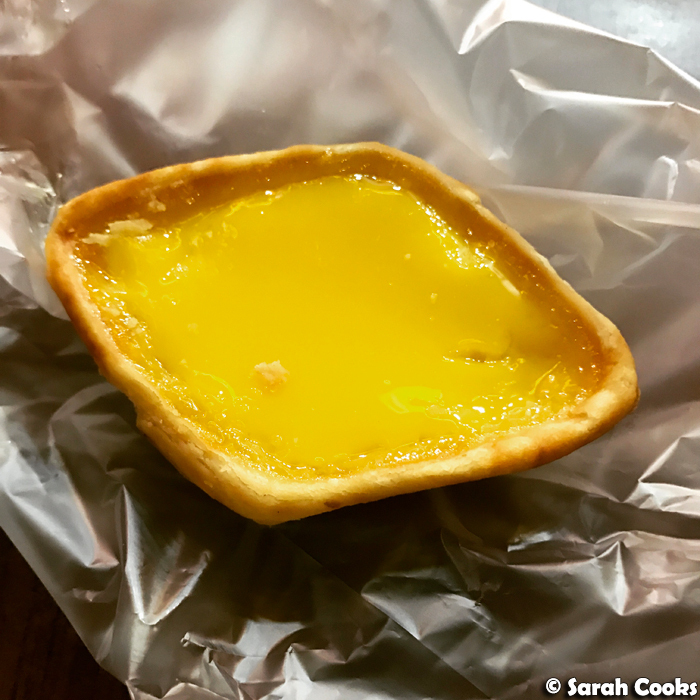 The egg tarts, in their unique diamond shape, with flaky flaky pastry and quivering egg filling, were truly delicious. What can I say? The girl has great taste! 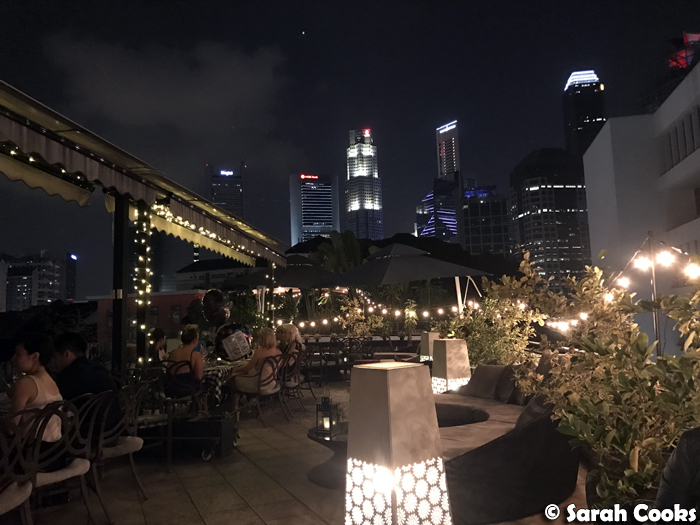 We then retreated to Aria Roof Bar (33 Erskine Road, The Scarlet Hotel, Singapore 069333) for some ice-cold drinks and more chatting, before going home and collapsing in bed. It had been a long day. 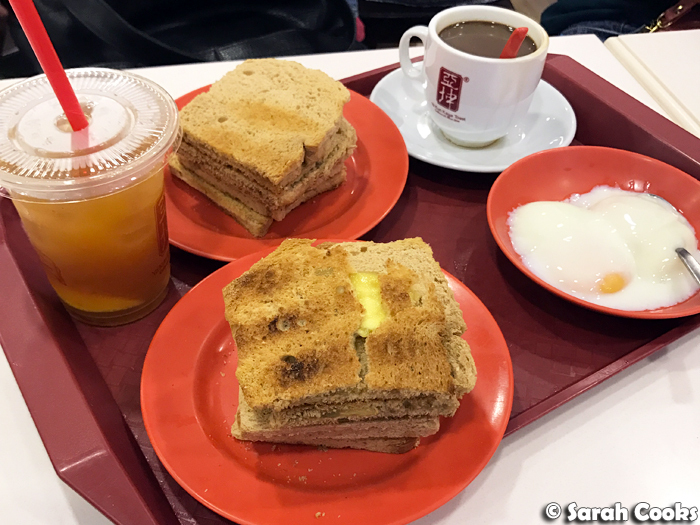 And on the way out of Singapore the next morning, we couldn't resist another kaya toast breakfast, at the Changi Airport branch of Ya Kun Kaya Toast (Terminal 3). With some extra kaya balls because why the heck not! And that was our trip to Singapore! A bit of a whirlwind, but so much fun! It was a really great trip, and I'm so glad we made the time for it. It had been quite some time since we'd been anywhere in Asia (Bali 2014 was the last trip), and I didn't realise how much I missed it! 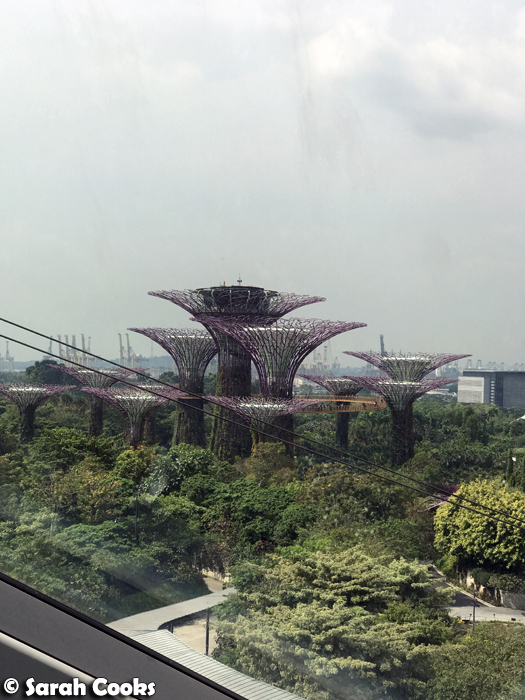 If you've got any recommendations for Singapore, any great places I've missed, please hit me up in the comments! Argh kaya toast! And that oyster cake! 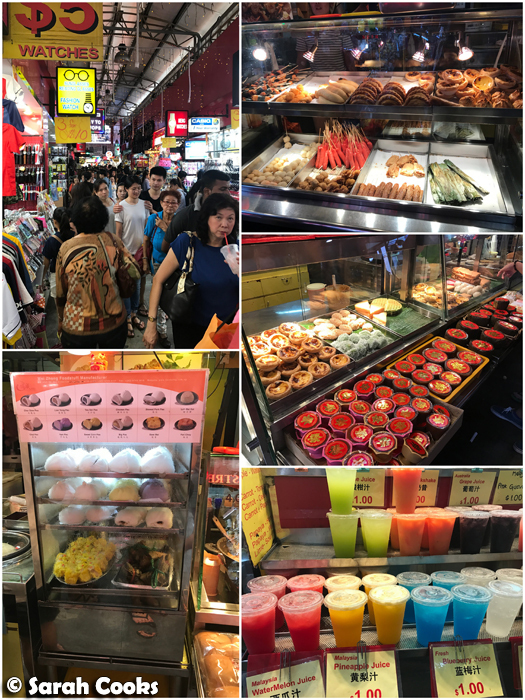 I love S'pore - so compact and easy to get around to eat all that hawker food!